The Morgan 4-4 sports car. In 1936, Henry Morgan and his son visited Ford's new factory in Dagenham. Following the visit, he confirmed his intention that Morgan was to remain a small and flexible company, and would not follow the route of mass production. He intended to follow in the footsteps of men like Donald Healey, who were car enthusiasts at heart, and whose philosophy was that of being product rather than process led. By 1936, the Morgan Three Wheeler sports car had been in continuous production for 27 years, in which time some 30,000 units had been built. However, the introduction of small, economical, mass produced cars spelt the death knell for the three wheeler. The company's answer was to design and build a completely new car which had four wheels, not three. 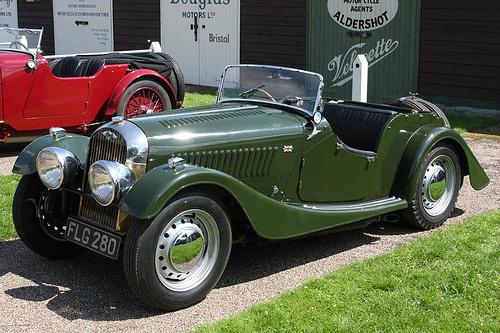 The new model was named the Morgan Four Four sports car. The prototype was rigorously tested both in trials and on the track, and was finally launched at Motor Shows in both London and Paris. The title "Four Four", chosen to differentiate it from the previous three wheelers, confirmed it had four wheels, not three, and four cylinders, not two. The car had a steel chassis with steel, later replaced by aluminium, body panels on an ash frame, which gave it the necessary strength and light weight required in a sports car. The 4-4 was an immediate success. The original two seater Morgan 4-4 convertible, launched in 1936, was the most sought after of the three variants. Up to 1939, the car was powered by a 1122 cc Coventry Climax engine, developing 34 bhp. Beyond this, it was replaced by the Special 1267 cc, overhead valve engine, developing 39 bhp, uniquely supplied by the Standard Motor Company. Prior to 1938, it incorporated a four speed Meadows gearbox, which was then replaced by an equivalent Moss unit, fitted in the centre of the chassis, and connected to the back axle by a short prop shaft. The car used 8 inch Girling drum brakes, activated by a rod and cable. 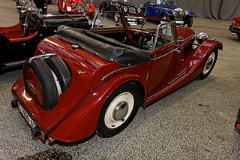 In 1937, the four seater variant was announced, also using the Coventry Climax engine. Then, in 1938, and using the same chassis, the drophead coupe was launched. This was an elegant touring car, with high doors, a distinctive windscreen, permanent window frames, and a small wooden panel at roof level which allowed the hood to be closed easily and effectively. The early model was fitted with the Coventry Climax engine, which was later changed to the 1267 cc Special engine from the Standard Motor Company. After WW2, all versions of the 4-4 were fitted with the Standard 1267 cc engine, and continued to be built until 1950, when succeeded by the larger Morgan Plus Four. The 4-4 Series further reinforced Morgan's reputation for quality, performance sports cars. 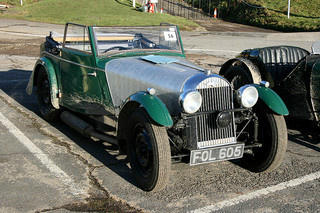 Morgans acquitted themselves well in road races, such as the RAC Rally, as well as the famous Tourist Trophy in which, in 1937, a Morgan 4-4 sports car won on handicap. Based on the 1937 winning 4-4, a new limited edition model, called the TT Replica, was showcased, with a distinctive sloping rear panel, and sporting a single spare wheel. Another limited edition model, called the Le Mans Replica, was based on the 4-4 entered in the Le Mans 24 hour race of 1938 and 1939. In 1937, a small number of modified cars were built for the race track, and featured 1098 cc Coventry Climax engines, with balanced crankshafts, developing 42 bhp. In 1938, a works tuned Morgan 4-4, with a novice driver, was entered in the Le Mans 24 hour race, and finished 13th overall. The following year, the car finished 15th overall, and second in class at Le Mans. In 1946, car production resumed but, following post WW2 shortages, the allocation of steel was on the basis of export production, rather than for the home market. Accordingly, the company embarked on an intensive export drive for new markets. As a result of steel shortages, post WW2 Morgan body panels were built entirely of aluminium. In 1947, the Standard Motor Company introduced a new single engine policy whereby, after 1949, the special arrangement for the supply of the 1267 cc engine to Morgan would cease. In 1949, a prototype of a new Morgan was unveiled, featuring a Standard Vanguard 2.1 litre engine which generated a much improved performance, when compared with the 4-4. The new car was designated the Morgan Plus Four sports car, and was launched in 1950. At the very first Goodwood Motor Racing Meeting in September 1948, Peter Morgan drove a Morgan in the 1100 cc class and finished in second position. The company was particularly successful when its car were entered in motor races and hill climbs that were aimed specifically at unmodified production cars. In 1954, a new company innovation, the cowled radiator, was introduced in order to take advantage of its additional aerodynamic features. In the public relations arena, Morgan was at the forefront of securing the benefits derived from celebrity endorsements. In fact, during the 1960's, such notaries as Brigitte Bardot, David Bailey, and Ralph Lauren were all seen driving about town in a Morgan sports car. Morgan had always concentrated on producing simple cars, with the intention of making them available to the widest possible market.